3 double rooms (all en suite). Guest lounge and dining room. Views towards the Loughor Estuary. Ideal for walkers and birdwatchers. Llanmadoc is a small unspoilt village, nestling on the north tip of the Gower Peninsular. It has breathtaking views across to the Pembrokshire coastline and the Preseli Mountains. Below the village lies the Whitford Nature Reserve, a naturalist’s paradise. Seven miles of unspoilt sandy surfing beaches are only a couple of minutes by car and ten minutes on foot. The area has numerous attractive walks through a variety of habitat – the Cheriton Wood and River, Cwm Ivy Wood, Llanmadoc Hill, walks through the nature reserve, to name a few. The village has a pub with a restaurant and a shop/post office. Pony trekking and riding are readily available. Swansea, with it’s modern shopping complex,indoor leisure centre, marina and night life is only a half hour drive away and all the beaches and villages on Gower are only a short drive away making it the perfect base for your holiday. Tallizmand is set on the side of Llanmadoc Hill in beautiful surroundings. 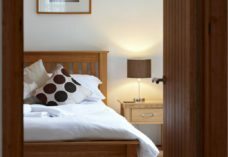 All the bedrooms are tastefully furnished with TV, hairdryer, coffee and tea making facilities. Full English Breakfast, home cooking, and packed lunches are available. We also accommodate special diets. There is also a place to store surfboards or bicycles and a drying room for wet clothes. Leave the M4 at Junction 47, Swansea West. There are four simple roundabouts to negotiate. Take the A4118 to Upper Killay out on to the common and over the cattle grid. Turn right for North Gower on the B4271 (signposted Llanrhidian) follow the road for approximately 8 miles. Turn left at Llanrhidian (Esso Petrol Station on right). Continue west for half a mile and then turn right just past the Greyhound Inn at Oldwalls. Continue west for just over 3 miles and the Britannia Inn is on the right. Continue up the hill towards the village and Tallizmand is approximately 200yds on the left. Have special requirements? Call David Main on 01792 386373.